The Dallas Stars have climbed back into playoff contention after a troubling start to the season, and will likely be one of the bubble teams looking to secure their spot by adding talent at the trade deadline. Elliotte Friedman of Sportsnet writes in his latest 31 Thoughts column that Dallas is “dangling” Mattias Janmark in addition to Valeri Nichushkin and Brett Ritchie, who had previously been linked to trade talks. Dallas hasn’t gotten enough production out of the bottom half of their lineup this season, relying heavily on the top trio of Tyler Seguin, Alexander Radulov and Jamie Benn to carry the offensive weight. The team traded Devin Shore earlier in the year to bring in a new face in Andrew Cogliano, and it now sounds like they might be considering moving some of the other disappointing names. The above mentioned trio of trade candidates have combined for just six goals and 27 points this season, with Janmark leading the way with 15 of those. The 26-year old forward was a 19-goal man a year ago, but has been snake-bitten all season and is shooting just 4.3%. Janmark and Ritchie are both restricted free agents with arbitration rights at the end of the season while Nichushkin is under contract for another season at a $2.95MM cap hit. The latter is younger than the other two, but also has failed to score a single goal this season in his return to North American and is routinely seeing fewer than 12 minutes of ice time in recent weeks. It’s hard to trade an asset in that situation, given Nichushkin is at his absolute lowest value right now. With a significant amount of cap space remaining to them, the Chicago Blackhawks find themselves in an unusual position. The team has been very quiet this offseason, not including the trade that sent Marian Hossa to Arizona or signing Cam Ward to be the backup goaltender. However, with almost $5.5MM in cap space available to them, the Blackhawks have a number of options in front of them, according to Scott Powers of The Athletic (subscription required). The scribe writes that one option is to spend some of that money on current free agents, but aside from Rick Nash, there are few options there. With Brandon Davidson agreeing to a PTO, the team could look to add a couple more of those to bolster their roster as they do have a number of youngsters expected to make the team. If one should struggle, the team could lean on those free agents. The team could also make a deal for a player a team is looking to unload before the season starts. Powers also adds one of the better possibilities would be to wait for the trade deadline and acquire a player then. The only issue there is that there is no guarantee that Chicago will be heading back to the playoffs. Another down season could send them back to the lottery, which means they wouldn’t want to spend that money on deadline acquisitions. Of course, the final option would be to do nothing, but regardless, the team is better off with cap room than in past years. It’s now just how they intend to spend it. The Athletic’s Scott Powers (subscription required) profiles the recovery of St. Louis Blues’ winger Robby Fabbri, who missed the entire 2017-18 season after enduring a setback in his recovery during training camp last season from ACL surgery that he had after suffering a knee injury on Feb. 4, 2016. Now after two surgeries and a full year to recover, Powers shows what the 22-year-old has gone through and how he is finally ready to compete for a top-six role for the Blues this year. The Athletic’s Sean Shapiro (subscription required) studies the film of Valeri Nichushkin, who had a impressive rookie season back in the 2013-14 season, then missed most of the following season. After just an average showing the next year, Nichuskin left the NHL for the KHL, but now is returning after a pair of average seasons there. Now back, Shapiro suggests that his more developed 6-foot-4 frame should be a major factor in front of the net, but that a 30-point season would be a realistic expectation for the 23-year-old as he isn’t considered to be a great finisher in front of the net. The Minnesota Wild may have been quiet all offseason, but the team may make multiple lineup changes this season. One person who is likely to benefit will be Jordan Greenway. The 21-year-old signed with the Wild after a three-year stint with Boston University and is expected to jump right into the lineup, according to the StarTribune’s Sarah MacLellan. “I think he’s ready,” coach Bruce Boudreau said. “ … It’s his job to lose.” Greenway appeared in 11 games for Minnesota last year, posting an assist in six regular season games, and a goal and an assist in five playoff games. St. Louis Post-Dispatch’s Jim Thomas writes that considering the strength of the team’s defense, new backup goaltender Chad Johnson should thrive in the Blues system and be able to put up solid numbers. Johnson, who struggled immensely in Buffalo last year, posting a .891 save percentage in 36 games, is likely to have a bounce back season. In fact, Thomas writes that Johnson’s career numbers are actually quite a bit better than former backup Carter Hutton, who is now in Buffalo. After the Ottawa Senators offered superstar defenseman Erik Karlsson a contract that was not well-received, the team gave interested competitors the permission to speak to him about contract terms. NBC Sports’ Kathryn Tappen reported that the Senators’ offer was for eight years at $10MM per season, an amazing amount of money to a layperson but truthfully an insult to Karlsson in light of recent contracts signed by Drew Doughty and John Tavares. As such, Tappen and others have added that other teams are now in hot pursuit and serious trade talks are underway. As of this evening, the leader in those talks are the Dallas Stars. The Athletic’s Chris Stevenson has heard from a source in the NHL that the Stars have emerged as a front runner for Karlsson and that Dallas and Ottawa are deep in talks about a trade that would include the Norris Trophy winner but not overpaid forward Bobby Ryan, a major hindrance in many teams’ acquisition plans. Stevenson is based in Ottawa and is allegedly close to the Senators and his The Athletic colleague in Dallas, Sean Shapiro, says that he has also heard that the Stars are legitimately interested and that a hypothetical deal is a real possibility. Immediately, the question is what the potential return for the Senators could be that would both pry Karlsson out of Ottawa but also keep Ryan there. Shapiro believes that any deal for Karlsson would have to include young defenseman Julius Honka, while Ottawa may actually prefer a more established name like Esa Lindell. It would also make sense for the Sens to target the Stars top blue line prospect, 2017 third overall pick Miro Heiskanen. Others who could be part of the package include young two-way centers Radek Faksa or Devin Shore, recently re-acquired winger Valeri Nichushkin, and project forward Riley Tufte. While only time will tell if a trade is completed and what the pieces will be, this is the first time that any specific team has been confirmed to be in real trade talks for Karlsson and it now seems like only a matter of time before the all-word defender is traded, to Dallas or elsewhere. The wait is over for Dallas Stars fans, as Valeri Nichushkin is back in the NHL. The Russian forward has officially signed his two-year contract that carries a cap hit of $2.95MM. Nichushkin is returning after two years in the KHL, and will add another dimension to the Stars offensive group. The 23-year-old and former 10th overall pick back in 2013 started out his NHL career well as he scored 14 goals and tallied 34 points in his rookie campaign immediately after being drafted. The 6-foot-4, 205 pound forward is referred to as a freight train, but a hip injury derailed his second year and he was never able to recover and saw his playing time decrease the year after that. The moment he hit restricted free agency, Nichushkin took his game back to the KHL, where he posted 11 goals and followed that up with a strong 16-goal performance this past year for CSKA Moscow, which was good enough for third on his team in goals scored. Now back in the fold in Dallas, Nichushkin hopes he can continue along the career path that he started at. He will be given every opportunity to take a second or third-line spot on the wing this season with the Stars. June 1st: The contract is now official, as CSKA announced the signing this afternoon. It is a one-year deal for Dahlbeck, opening the door to an NHL return in the near future if his season goes well in Moscow. For their part, CSKA seems excited for the potential that the veteran defender brings in their efforts to strengthen the blue line next year. May 22nd: According to Chip Alexander of the Raleigh News & Observer, Carolina GM Don Waddell has confirmed Dahlbeck’s departure to the KHL. April 27th: It was a forgettable 2017-18 season for Klas Dahlbeck. The 26-year-old defenseman re-signed with the Carolina Hurricanes expecting an expanded role, only to lose his job to rookie Haydn Fleury. Dahlbeck proceeded to suit up for just 33 games, spending much of his time watching from the press box. In what little action he saw, Dahlbeck recorded just five points and had the worst possession numbers of any Hurricanes defenseman. It was a disappointing campaign for the 2011 third-round pick and former AHL standout who at one time carried much promise. Now it seems Dahlbeck is looking to move on the next stage of his hockey career. According to the Sports Business Gazette out of Russia, Dahlbeck is preparing to sign in the KHL this season (link in Russian). Dahlbeck won’t be joining just any team, but one of the league’s most elite organizations, CSKA Moscow. CSKA is fresh off the second-best regular season record in the KHL and an appearance in the Gagarin Cup final. They’ve been collecting displaced NHLers in recent years, including the likes of Valeri Nichushkin, Mikhail Grigorenko, Nikita Nesterov, and Alexey Marchenko, and the Swedish-born blue liner Dahlbeck appears to be next in line. While the contract has yet to be signed and neither CSKA nor Carolina have confirmed the move, this is a deal that seems logical and likely to happen. Dahlbeck has shown capable two-way play in the past and will likely step in and be a solid presence on the CSKA back end. Meanwhile, it’s no loss for the Hurricanes, who have one of the most talented young defensive corps in the league, with six bona fide starters under 27, and could still add to that group with top prospect Jake Bean next season. I think in the end, Val’s going to come back as a Dallas Star here this year. If Nichushkin does return to the NHL he’ll have to sign a new contract after leaving as a restricted free agent in the summer of 2016. By extending a qualifying offer the Stars retained his exclusive rights, and would be able to sign him to any deal the two sides felt comfortable with (within the confines of the CBA, that is). Selected 10th overall in 2013, Nichushkin got off to a brilliant start in Dallas by scoring 14 goals and 34 points in his rookie season. The big forward is a freight train on skates, and proved to be a difficult player to handle even at such a young age. Unfortunately, a hip injury robbed him of most of the next season and after a disappointing 2015-16 under Lindy Ruff—a head coach that reportedly clashed with the young Russian winger—he was off to the KHL. His return to the NHL maybe wouldn’t be as impactful as Ilya Kovalchuk’s impending signing, but would certainly give the Stars another impressive young talent to build around. Finishing third on CSKA Moscow in goals this season, Nichushkin was held out of the Olympics as one of the banned Russian players. He had to watch as his countrymen took home the gold medal, before injuring his shoulder in the KHL playoffs and missing out on the IIHF World Championship as well. Lightning center Tyler Johnson’s full no-trade clause kicks in at the beginning of free agency this summer, notes Roger Mooney of the Tampa Bay Times. Tampa Bay does not have a lot of payroll flexibility heading into next season and has a possible long-term extension for winger Nikita Kucherov on the horizon so they may want to free up some funds at some point this offseason. If that’s the case, they may look to do something sooner than later and with Johnson locked up through 2023-24 at a $5MM AAV, he’s someone that they will have to consider moving by the end of next month. There should be no shortage of suitors considering he’s coming off a strong year with 50 points and plays a premium position that’s in high demand. After spending the past two years with CSKA Moscow of the KHL, the Stars could have winger Valeri Nichushkin back for 2018-19. Mark Gandler, Nichushkin’s agent, told Sean Shapiro of The Athletic (subscription required) that there is mutual interest in getting a deal done and that he expects his client to be suiting up in Dallas in October. 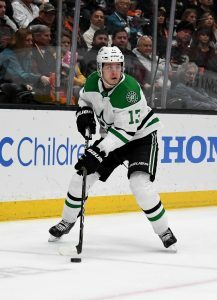 The 23-year-old put up 16 goals and 11 assists while averaging 16:28 of ice time per night and would likely slot in as a middle-six forward with the Stars. The Capitals explored trying to reacquire defenseman Nate Schmidt from the Golden Knights following the Expansion Draft, reports Pierre LeBrun of TSN and The Athletic (Twitter links). However, Vegas GM George McPhee placed a high price tag for them to do so and they were certainly right to do so; the 26-year-old led the team in ice time while collecting a career-high 36 points. In advance of his next trip through free agency, Avalanche winger Nail Yakupov has parted ways with agent Igor Larionov, reports Igor Eronko of Sport-Express (Twitter link). While the 24-year-old came to Colorado as an unrestricted free agent, the team can still control his rights with a qualifying offer just shy of $920K next month although he will have arbitration eligibility. Yakupov suited up in 58 games with the Avs this past season, recording nine goals and seven assists.